Nintendo's newest mobile smartphone game, Fire Emblem Heroes, is officially out on the iOS App Store in the U.S. [Direct Link], as well as in Japan, Australia, Europe, and over 30 other countries. 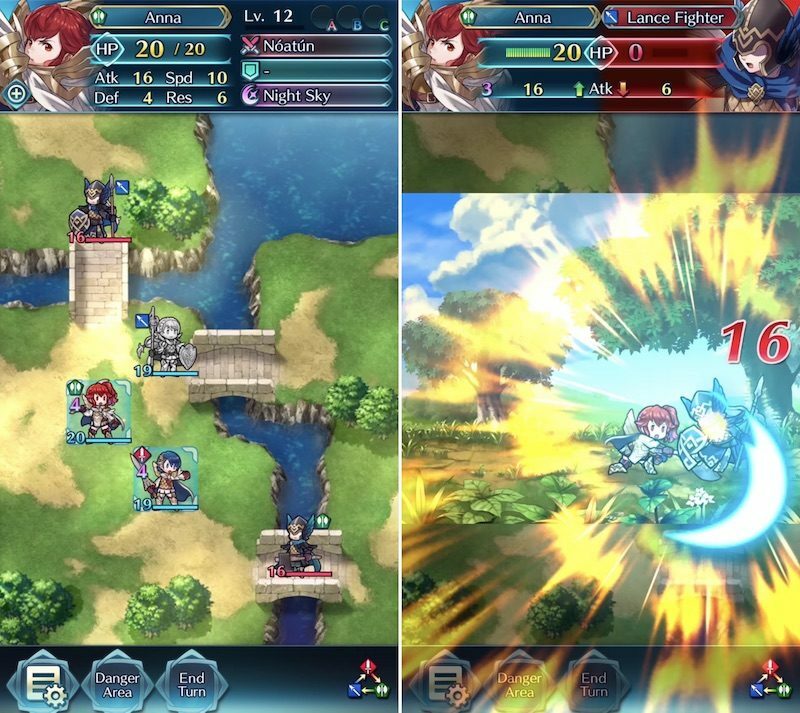 Announced last spring, Fire Emblem on smartphones adopts the tactical role-playing gameplay of the popular franchise, with a few mobile-optimized tweaks. These changes mainly center around battle maps that have been designed to specifically fit smartphone screens. To attack, players tap and drag their allies over the enemy forces, while paying attention to a rock-paper-scissors weapon types system that greatly affects attack power in the heat of battle. The main game lies in the "Story Maps," where players will fight through enemy defenses to complete objectives, eventually earning Orbs that summon classic Fire Emblem characters to fight for them in battle. Orbs will be one of the monetization points of Fire Emblem Heroes, as players can also choose to skip earning them through Story Maps and pay for the booster item in the game's shop. Nintendo hasn't yet detailed what else will be available as an in-app purchase in the game, but it did confirm Fire Emblem Heroes will be free-to-download with IAPs as its main revenue model. Also included in the game will be an Arena mode where players can fight against rivals around the world to earn high scores, increase rankings, and get exclusive rewards to increase the abilities of each hero. Additionally, Training Tower will let players hone their Fire Emblem skills with randomly generated maps, and Hero Battles will pit players against new Heroes during limited events -- winning will convince them to become an ally. The official website for Fire Emblem Heroes has more information about gameplay, including its Home screen where players will check notifications, view their friend list, and peruse various other front-end features each time they log in. Fire Emblem Heroes is launching simultaneously on the iOS App Store and Google Play, similar to Miitomo but unlike Super Mario Run, which remains exclusive to Apple devices with a planned launch on Android in March. For those keeping count, that makes Fire Emblem Heroes the third official release for Nintendo's original smartphone gaming plan it detailed back in 2015. We now know that Animal Crossing and the unknown fifth game won't launch before March, and Nintendo recently reported that its future on mobile devices won't end after the launch of the fifth game made through its partnership with DeNA. This week, the company confirmed its intention to release two to three smartphone games every year. The game is available in over 30 countries, including the United States, United Kingdom, Australia, Mexico, and more. The full list of launch countries can be found within a link in the top right section on the official Fire Emblem Heroes website. "*Internet connectivity required to play"
*Offline mode required for interest. "Fire Emblem is on Google Play!" - check Google Play, not found. "Fire Emblem is on Apple's App Store!" - check App Store, not found. Had been? Aren't they still? Apart from iOS and Android, I don't think they've ever made a game for anything but Nintendo consoles? Also, this article is a lie. I can't find Fire Emblem Heros in the App Store, and the link doesn't work. I wonder how much Partia's sales have been boosted by virtue of people searching for Fire Emblem and it being the top result... I've thought about trying it before, but the fact an official Fire Emblem is coming has made me decide to just wait. "It's rolling out globally" implies the US is included. I see the next part immediately changes it's tune to just Japan and Australia, but I thought that was more along the lines of "including these regions that you might think we're not including when we say 'globally'". Instead, I guess MacRumors definition of globally only includes those regions. "Rolling out" Means it's not out every where, but is continually updating as the App store does for each region. Are you counting Pokemon Shuffle as an official release here? Because it probably should be counted. Miitomo, Mario, and this game. Hey guys, we posted a bit early for our U.S. readers since the game began rolling out in other territories first. I'll update the article and we'll tweet again as soon as we see it out on the U.S. App Store. Sorry if we got anyone's hopes up in the states too soon! I was specifically counting the DeNA partnership games that Nintendo included in its 2015 announcement of five games by March 2017. To be fair, the direct link precedes the part of the article that you can't be bothered to relate. Why should his reading effort be any higher than your posting effort?